The Althorpes Islands, a small group of islands south of Yorke Peninsula, were first sighted and visited by Captain Peter Dillon in 1816 who harvested 100 seals. Later, better known visitors were Matthew Flinders in 1802, followed that same year by Nicolas Baudin. After European settlement of South Australia in 1836 several ships had come to grief around the island before the building of a lighthouse was completed. In July 1862 the steamer Marion was wrecked. On 14 November 1872 the steamer The Lubra picked up two men and a boy who had been cast away on the Althorpes while sealing. They had been without food for six days. The Iron King went on the rocks in December 1873 and a year later the barge Fairfield was wrecked. During the 1870s pleasure trips were organised to the Althorpes for seal and wild geese shooting. H Smith who was living on Kangaroo Island before the colony was proclaimed caught nine seals at Althorpe in April 1871. As early as 1863 there had been talk about a lighthouse on the island. In 1873 it was officially proposed to build a lighthouse but it did not get started until 1877 when the island was also considered for a Quarantine Station. This never eventuated as there was no water on the island. During these years there had been much talk but very little action. The cost of the project was the main problem. As late as October 1876 the Treasurer moved that �480 should be borrowed to finance the building. During February 1877 the steamer Governor Musgrave returned from Althorpe with Captain Fergusson, SM and Mr RP Hickson, President of the Marine Board, who had with a group of other men, inspected the site. 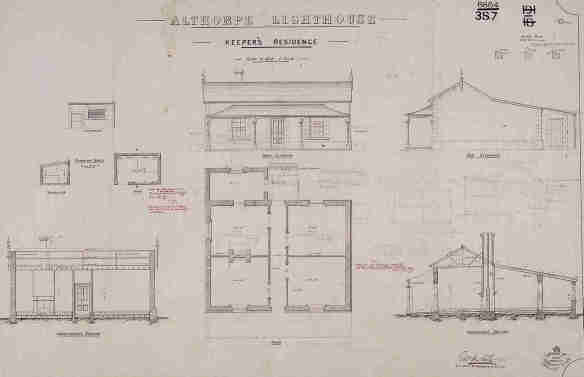 The final decision to build the lighthouse, designed by Hickson, was made by the government on 18 August 1877. It would be erected on a forty foot tower on the highest part of the island. There was a problem though. Tenders had been asked for but none were received. 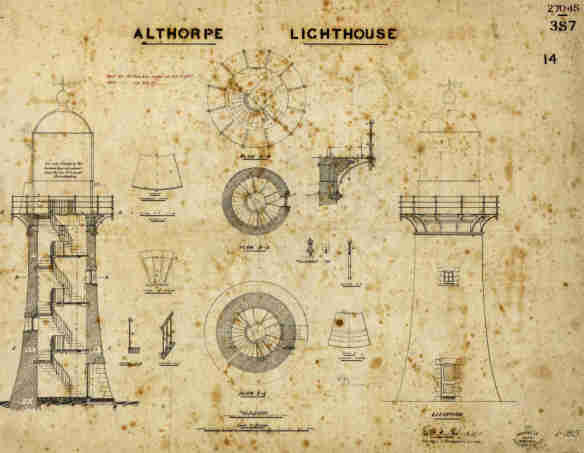 In September it was decided that the lighthouse would be erected by the Harbours and Jetties Department. Early October the cutter Young St George took the overseer, his men and stores to Althorpe to start work. As there was no water on the island during construction time water had to be brought from Adelaide at an additional cost of �00. On 3 January 1878 the Young St George, broke its moorings while supplying the site and finished up on the rocks. For the time being its role was taken up by the Lady Diana until March when the government had bought the Swallow. On 16 March the overseer Mr Anley was killed by a falling rock while asleep in his tent. He was replaced by Mr Porter. Still more trouble and setbacks were reported in June when the works came to a standstill due to unforeseen difficulties. On 3 October 1878 it was reported that; notwithstanding the very rough weather, good progress has been made with this work during the past month. The longitudinal runners from the jetty to the foot of the cutting have been fixed in position ready to receive the rails, which will be put on as soon as they can be supplied. The earthworks for the tramway from the stone quarries to the site of the buildings are completed, and the tower will be commenced almost immediately. The tower and keepers' cottages were built of limestone and sandstone quarried on the island. The jetty is quite finished, and the approach secured by a good sea-wall. Advantage was taken of the recent rains to fill all the tanks and barrels on the Island, so that there is now a good supply of water in hand. An attempt to conserve the rainfall by means of holes and dams was unsuccessful, owing to the porous nature of the soil. There is, however, a little water in the natural clay-pans, but this is fit for building purposes only. Express and Telegraph 25 November 1878. During November it was advertised that the whole project would be finished on 14 February 1879. It was; at the cost of �,000. Included was the cost of �244 for the revolving light, which could be seen every 15 seconds from as far away as 25 miles. Mr AC Webling of the Tipara lighthouse was appointed head keeper, W Stirling second keeper and J Franks third keeper. Unfortunately as many as six ships have been wrecked on the rocks since its completion, the last one in 1982. For a period of 20 years guano was mined on many islands in South Australia and Althorpe Island had been a great source, as the shear-water (mutton bird) population was estimated to be around 23,000 or 1% of all those birds who migrated from the Bering Strait. Althorpe Island continues to harbour the Long Nosed Fur seal and the endangered Australian Sea Lion. 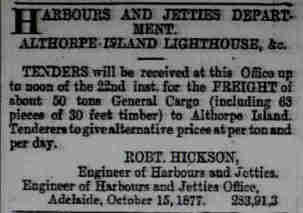 On 18 September 1919 information was received at Port Adelaide of the wrecking of the SS Pareora. She was on her way from Port Pirie to Hobart. After a few days it became clear that of its 18 crew, mostly from Port Pirie, eleven had drowned but only three bodies had been recovered. They were Captain JC McFarlane, JG Braithwaite and Simon Cordies. There have been many ship wrecks around the South Australian coast during the last 180 years. Many of them around Yorke Peninsula and Kangaroo Island. The SS Pareora became a wreck and disappeared within a few hours. After an enquiry by the Marine Board it was found that the disaster was caused by careless navigation. This was not the first time, nor the last time that a judgement like this was passed. 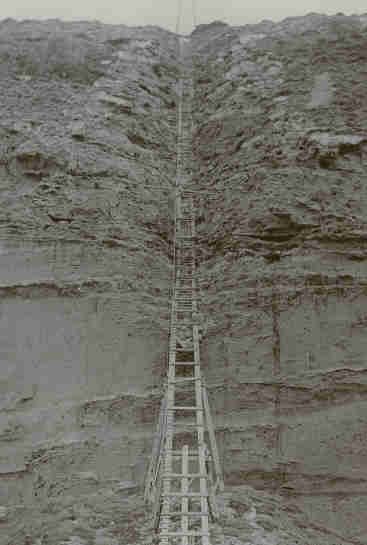 In 1886 a telephone connection by cable was made to Cape Spencer. After conversion from kerosene to electricity in 1963 the light beam could be seen from as far away as 45 km. The Lighthouse was automated in 1991.